The Apple and Google brands had the most significant impact online in the fourth quarter of 2010, generating "impact values" of $941.5 million and $875.8 million, respectively, based on high volumes of online media buzz and social media conversation, according to a study by General Sentiment that assigns a dollar value to a brand's online exposure. Apple led the Top 20 list for the third straight quarter, with 60.5% of its impact value created via social media conversation and an additional 12.5% via Twitter. 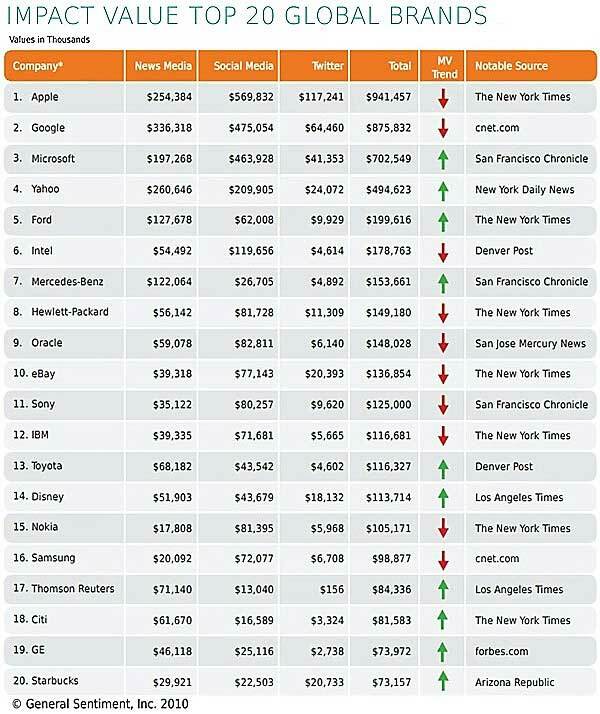 Some 27% of Apple's impact value ($254.4 million) was generated by online news, much of it from The New York Times.